Since getting photoshop (and an excellent modelling light for Christmas) I've been tinkering with some images and an idea came to me...40k comics. The following are just some initial attempts but they make me chuckle, enjoy at your leisure. New HH Novel Mark of Calth? I was on Amazon a moment ago and was recommended to buy 'Mark of Calth' a Horus Heresy novel available on Pre-order with no product details other than it being in paperback and its publishing date is 13th August 2013. I searched on the Black Library website and could find no sign of this book. Does anyone know anything else about it? I've seen the artwork before but not heard anything about the book! I'm hoping it is a direct follow up to Know No Fear and will tell us what happened to Remus Ventanus and the other Ultramarines as they are forced to go underground to avoid the storms raging on the surface. I am still here, honest. It's been a few days since I added anything to the blog, partly because of Christmas at my grandparents but mostly because I've been building many, many Eldar in preparation for 2013. You can check these out at craftworldanaris@blogspot.com. Despite this I have found the time to continue my work on the Guilliman conversion (in the Black Library pic above shouting "I'm fabulous!") and finish building my Tartaros pattern terminators. These were quite fiddley to begin with and made me think yet again that Forge World really should supply instructions with some of their kits...that or I should just think things through a bit more. I enjoy playing narrative missions considerably more than standard 'army vs army' slug fests, there's just something more emotive and compelling about these kind of fights. The LOTR SBG did this really well and I loved reliving the Fellowship's flight through the Mines of Moria or Boromir's last stand on Amon Hen. Know No Fear provides plenty of opportunities for the creation of narrative missions and I am going to add a page that is dedicated to just that. Despite my Tartaros Pattern Terminators arriving today I'm struggling to get excited. Partly because I still have a week of work left before the holidays and partly because the TPTs haven't worked out how I thought they would. Bugger. Christmas is fast approaching and whilst I do enjoy the festive period it is so chaotic that it is rare that I'll get much building/painting done. Normally I spend my Christmas holiday bouncing from house to house as I visit various sections of the family, we've managed to reduce this from 5 houses to 2 this year which means that I might, just might get some hobby time this year. As I was rooting through my bitz box for something I inadvertently picked up the Marneus Calgar model that had been left over from the Honour Guard and a thought occurred to me...care to guess what the thought was? Well there's a clue in the title. Forge World will make a Guilliman model, fact. I read it somewhere on the internets so it must be true. 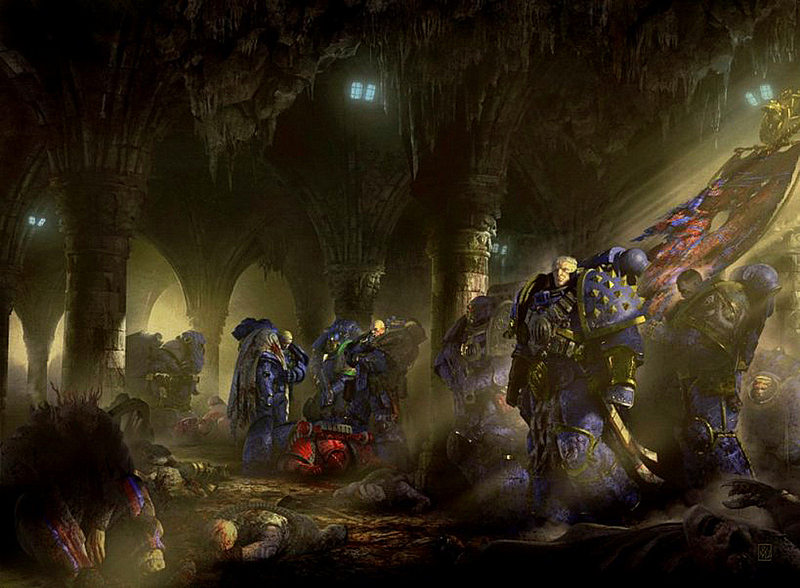 However, I doubt that this will happen anytime soon - they'll have to release another HH book for it first and the next one wont be involving the Ultramarines (Drop-site massacre anyone?) and so I'm going to need a stand-in until they get round to it. Finishing squads is always something I find a bit tiresome, there's something about the factory line process of painting batches of models that can be a bit tedious. However the efficiency of this process means that there really isn't much in the way of a viable alternative - particularly if you have large quantities to get through! Fiancee: "Thanks for doing the washing up!" Me: "No problem...yes, that's exactly what I was doing..."
All of the models that I have tried to do so far in this project have been tailored to match the descriptions in Know No Fear. However I loved this model and the only thing I could think to match it up with was Marius Gage, so here he is. Apologies for the poor picture quality but I thought I'd share this photo of my Ultramarines army in my display cabinet, I'm going to work on a proper set up for taking big shots but for now, this will have to suffice. After playing 80 minutes of a fairly fast-paced rugby match yesterday and then watching England beat the All-Blacks I was pretty shattered last night and so didn't have much time to paint before I heeded the call of the duvet. Still, I did manage to finish Captain Sydance (above) and therefore the Honour Guard which I purchased way back at the beginning of October! It's been a bit quiet on the blog recently, mostly due to a shed load of work stuff all happening at once. However, I am finding the odd few minutes here and there to keep going with my Ultramarines. This morning I took delivery of the new FW Assault Marines, though I'm out of glue (damn Thunderhawk...) so I can't do much with them this evening! I've almost finished painting the last of my honour guard marines - designated as Captain Sydance - there are just a few more bits of detailing to go before he can join the others. I'll try and get a shot of the army as is at some point soon. I mentioned in an earlier post that I loved the new Assault Marine models from Forge World well, this morning I bought a set. I love the dynamic poses and the sense of momentum in these models. Don't get me wrong, the earlier set is still fantastic but the variants seem to me to be more active, like they're actually hacking people to bits rather than simply bracing them selves for it. Aeonid Thiel is arguably the second most important character in Know No Fear. He starts of preparing himself for a dressing down from Guilliman himself before manning up and leading the orbital comeback against the traitorous Word Bearers. He even comes to the rescue of the big RG himself! My custom built Thunderhawk Spear of Calth has just been completed and is about to undertake fleet trials (painted) before being given the go ahead to enter active service (blowing stuff up!). Forge World is starting to come up trumps with the release of some flashy new upgrade kits for their Horus Heresy range. Whilst my lists don't have room for a heavy weapons squad, they are still pretty awesome. I really like the new Legion Champion though I won't be getting one - I'm perfectly satisfied with my own effort and while it looks very Betrayaley (new word?) it's not very Ultramarines... The thing I'm most excited about is the release of a second set of MkII Assault troops (shown above), these have a much more dynamic pose and will help me to avoid the problem of pose replication that can occur when you're dealing with small unit kits. Im not in the business of discussing rumours and breaking news but I saw this at the bottom of the GW website, looks like that Hobbit game is official! With almost all of the parts delivered (I'm waiting on you Forge World...) I have made a start on the Thunderhawk Gunship. The Space Marine at the bottom gives you a real sense of scale, this thing is going to be massive. It's currently sat in the Dark Vengeance box and is almost the same length. At the moment I have built the core structure but it has been a real headache! I seem to have hit a bit of a wall with regards to painting and I'm just not able to get in the right mood to do it, at least to paint things in blue...The Apothecary however isn't blue so I was able to get him done reasonable quickly. After a jolly little early Christmas bonus from work I have gone ahead and ordered the Stormravens and Forge World bits I need to complete my custom Thunderhawk gunship. The parts should be delivered soon and construction could begin as early as this weekend - though I have a busy schedule on Saturday and I still want to finish painting my tactical marines. It is more likely that I will make a start and press on with it over the following weekend. I have spoken about the character of Telemechrus at length in a previous post so this is more about the finished product rather than the inspiration for it. The paint scheme was the same as the Predator, the extra layers of Guilliman Glaze being used to clear away the brush strokes. It's been a busy weekend and as a result I've not done as much painting as I usually do, hence the lack of posts in the last couple of days. However, that hasn't stopped over a hundred people from visiting the site - to them I say a hearty "Thank you." Despite the rush, I have been able to get Telemechrus finished. His base is almost done, complete with dying Word Bearer (as promised), once it is all finished I will put up some pictures. I have also completed the first of my reconnaissance marines and I'm really happy with the way it has turned out. I have now got grand designs to customise the armour and helmets of each member of the recon squad using the characters from Halo Reach as my inspiration. The key difference will be the weapons, I'm going to try and give them all sniper rifles if possible. In my last post I voiced some ideas on how I should go about developing this army, should it be for looks or for playability? At the moment, I have to say I still don’t really know. Fortunately the two ideas are not mutually exclusive as there aren’t really any ugly/boring models in Forge World’s catalogue! The super glue is barely dry on less than half of my recent Forge World order but I am already looking to the future. Having poured through the army lists in Betrayal I've worked out that I've got 1,800 points already, admittedly this includes three HQ choices so in real terms I have a viable army of about 1,500 points - give or take a few melta bombs. Since I don't know of anyone at my hobby story doing a 30k army I'm at a bit of a cross roads. Since I have a legit army that could be used, do I continue in the direction of competitive army lists or do I stick with the aesthetic and buy stuff just because it looks cool? Telemechrus is a really interesting character in Know No Fear, as a newly interred dreadnaught he struggles with his 'life'. His disembodied self is trying to deal with the isolation of being cooped up in a sarcophagus and suppress a rising fear of his new existence. Abnett does a really good job of putting you inside the sarcophagus with him and you get a real insight into the sort of trials and tribulations faced by someone who is caught between life and death. I love the fact that in 30k you can have scouts with power armour, a sniper rifle, melta-bombs AND a USR: Stealth upgrade! Today being the launch of Halo 4 I've sculpted a helmet based on Master Chief's Mjolnir armour. I shall confess that sculpting is not my forte but I'm actually quite proud of my effort here. When it's dry I can file the sides down a bit and define the edges more. At the moment he will cut a solitary figure as I'm going to build the rest of the MkIVs as tactical marines and also because somehow I've run out of spare helmets! My Forge World care package has arrived and in all honesty I'm a little overwhelmed! That didn't stop me from getting stuck in to some building/conversion work though. I made a bee-line for the MkIV Command kit. I wasn't sure that I wanted to buy this but since placing the order this is the model I've kept coming back to in my head. Today is a special day because it is the beginning of a lengthy project-within-a-project; The kit-bashed Thunderhawk which I have chosen to call the Spear of Calth. Forge World call this the 'Business end'. The Fellblade is the first in a range of Astartes pattern super-heavy tanks to be released from Forge World. I saw the prototype of this at Gamesday 2012 and have been awaiting it's release with a great deal of anticipation (they'd sold out by the time I got round to deciding I wanted one). It's a stunning model (about the size of a baneblade according to the stats) and carries some serious firepower! Behold the Predator Executioner as it rumbles out of the Calth manufactorum! I've done my best to tie it in to the other models in the army but I've found that surprisingly difficult. With the heavy use of gold trimming on the Cataphractii I needed to find a way of applying some of that to the Executioner. I stated not so long ago that the reason I hadn't tackled my Honour Guard yet was that it was quite an intimidating prospect. It was, and is - I still have the other three to do but for now I am incredibly satisfied with the way my new Captain Ventanus has turned out. In total I used 32 different paints and 7 different brushes. At a conservative guess I would say this has taken me the better part of seven hours to do - a lot of that was time spent on the banner.